I adore cookbooks. Unfortunately (or perhaps fortunately) I do not have the space or the expendable income to feed my incessant cookbook hunger. To tide me over, every so often I head to the library and take out a big stack of cookbooks - usually renewing them until the library forces me to give them back (at which point I might break down and order one from Amazon, cough cough). On one of these escapades I picked up The Martha Stewart Living Cookbook: the New Classics, a book that hooked me with a single picture. 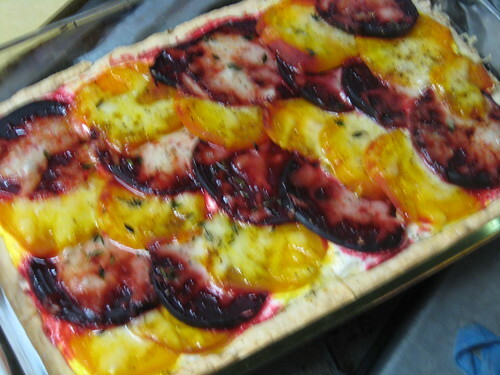 It was of a gorgeous tart, covered with multicolored discs of roasted beets and scattered with fresh thyme. And the recipe title: Beet and Goat Cheese Tart. Goat cheese, I love you. Beets, I love you more. I knew that it had to be in my life. So off I went to Whole Foods, braving the crowds in a quest for a trio of beets. 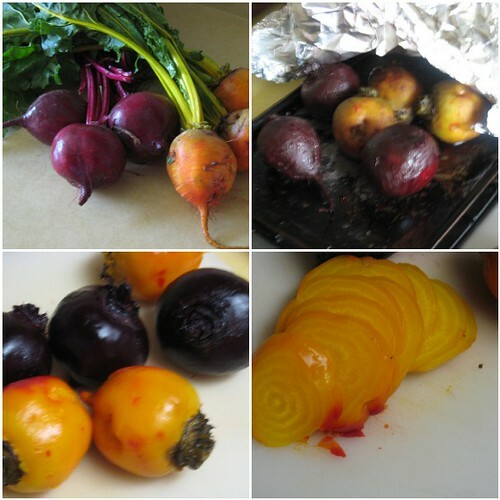 I bought bunches of red and golden organic beets, but the chiogga beets (which I had actually never heard of prior to making this tart) were nowhere to be found. I was a bit disappointed, I had loved their stripes in the picture, but I pressed on, grabbing some goat cheese, ricotta, fontina, and fresh thyme. My expectations were high as I started with Martha's "Perfect Pate Brise." I am going to admit now that I haven't had much luck with pie dough in the past, but this came together very quickly in my food processor. It made a nice crust, but I think that calling it "perfect" is a bit of an overstatement. The roasted beets, on the hand, were fantastic. When I sliced them I almost wanted to cry, they were so beautiful. Did I mention that I love beets? It's a good thing (I just made myself chuckle. Martha Stewart, good thing... Yes, I am easily amused.) that I roasted extra because I ate more than a few slices. As I spread goat cheese and ricotta over my crust and topped it with the roasted beets I marveled at the loveliness of my tart and prematurely patted myself on the back. Dratted expectations. Oh, the tart was not bad. It tasted good, quite good, but it was not the sublime taste experience that I had anticipated. The buttery pie dough along with all of the goat cheese (and I didn't even use the entire pound that the recipe called for) muted the flavors of the beets and the thyme. It was just too rich; I enjoyed the beets much more on their own. Despite my disappointment this recipe was not a total loss. I am already envisioning a new incarnation of this dish as a pizza. I think that a crusty pizza dough will be a nice foil to the creamy cheese and tender beets. Maybe toasted walnuts for crunch and some arugula for a peppery bite. Now I am picturing it as a salad. Oh yes, I will definitely be revisiting the beet and goat cheese pairing. Until then, stay tuned to find out how I put all of my beet greens to use. *I don't have the recipe for this tart, but it would be fairly simple to replicate. I have already provided the link to Martha Stewart's Pate Brise, and she also has a recipe for basic roasted beets on her website. I do think that the recipe needs some work, but that may just be my taste. If you have tried this recipe or if you have a beet recipe that you would like to share, leave a message in the comments.